Hi everybody. Are you feeling the potent energy of the forthcoming total eclipse that is building on 20th/ 21st January? We are currently in between two eclipses, which is known as a gateway or portal, taking us from where we have been to where we want to be. Not only is this a total Full Moon Lunar Eclipse, but also a “blood moon” and “super moon”, due to its totality and closeness to the earth. You could safely say it’s a full moon on steroids! As the ancients would have reminded us, blood moons often coincide with powerful endings and karmic lessons. In South Africa, the actual eclipse happens at 7:16am on 21st Jan, so we won’t be able to see it, but we will most certainly be feeling it –as some of you probably already are! This is an important astrological event, because it’s the last eclipse there will occur on the Leo / Aquarius axis for another 19 years. Eclipses happen in cycles (like everything in astrology) and straddle a pair of signs over a period of about 2 years. SO…, this one, is a big culmination of what was happening in our lives in February 2017 and also has longer threads back to the period between Aug 1998 and July 2000. With a colourful Leonine flourish, this closing eclipse can bring home the message and the learning of the last two/ 21 years. The degree of this eclipse is 0 degrees of Leo, opposite the Sun at 0 degrees of Aquarius. If you understand a bit of astrology and have a copy of your chart, look at the houses that Leo and Aquarius reside in and rule. For example, if Leo rules or resides in your 9th house of travel/ higher learning/ new philosophies, you might find that that something which was happening then in those areas, might occur again, but in a different way. Remember that we don’t just go around in circles. We evolve spirally, so this is another layer up! An eclipse always represents a gateway, an opportunity, an opening… as well as a time when whatever has been going on beneath the surface, tends to rise up. Being a full moon, the focus is likely to be on relationships – those with the people in our lives, as well as with our money, our bodies, our homes etc. The good news is that due to the way the planets are aligning around this eclipse, there is a real potential to clear and shift old patterns and obstacles! This lunar eclipse is a aligned with the North node, which means its connected with our unique purpose as co-creators! It beckons us to stand up and be counted, to put our money where our mouths are and to display our true colours. The sun in airy Aquarius (which represents visionary ideas, originality, out-the-boxness, community, the collective ) fans the flames of this moon which is in multi-coloured Leo, and represents individual creativity, expression, joy, warmth, generosity and fun. Together they form a square to Uranus, the planet of individual and collective consciousness and liberation. The alignment can bring about sudden changes (particularly if you have felt like you’ve been going around in circles on the same pond for a while). It can also feel disruptive or eruptive for some, particularly if you are hanging on to the status quo too tightly. Heads up – Its likely to expose whatever is preventing us from stepping into our true, individual beingness. If we’re able to find our still-point in the midst of all the current movement, there’s an excellent chance that we can use the energy of this eclipse to shift, resolve and clear old redundant issues, close a chapter, shift our consciousness and turn a corner. On the day of the eclipse, Jupiter and Venus (known as the two beneficial planets) are hanging out together at the same degree in optimistic, far reaching, adventurous Sagittarius and in a beautiful trine to Mars in Aries. And there’s more – ALL the planets are now direct (i.e none are retrograde) which is the first time in ages and ages. This provides us with a big, sunny, open window of luck, possible good fortune and forward momentum… at last! The eclipse ushers a beautiful invitation for us to connect with and express our true colours in all their glory– our inner sun, our heart, our creative life source (Leo) and then allow our unique expression to shine and ripple out into the world (Aquarius). If there is a situation or issue that you’re not sure how to resolve, try sitting quietly for a few moments. Connect to your breath and then gently place the situation inside your heart. Send send light and love into it, breathe out and surrender it upwards and outwards. Then be on the lookout for unexpected aha moments, ideas, synchronous meetings, downloads, inspirations and new answers to old problems. They WILL come in if we are open enough. We simply need to show up in our true multi-coloured presence! Take three pieces of paper. On each one, list one thing/ situation that you would really like to create/ bring into your life and the reasons why. Then on the reverse, write why you are ready to manifest it– no buts, no maybes, no negatives. Then release it to the eclipse and see what happens! To make the most of this visionary energy, I will be running two workshops over the next few weeks. I have only one place left on the 19th February and a few available on 9th Feb. Pop me an email if you would like to join us. I’m booking consultations now from the second week of February. On the very first day of the Year, we have a highly significant New Moon in Capricorn and then a second one on the 30th January in Aquarius. Two new moons in one month is relatively uncommon, although this year it happens in March as well. New moons always mark new beginnings and are a powerful opportunity every month to set intentions, send them out into the Universe and start new endeavours. The house where 10 or 11 degrees Capricorn falls is the area of your life where you’re likely to make a new start this year. This particular new moon is a whopper, with 5 planets in Capricorn (including transformative Pluto), all activating a Cardinal Grand Cross with three other planets. This is an unusual, challenging but potentially incredibly powerful planetary formation, which has been happening in fits and starts for a while now and will continue for months to come. 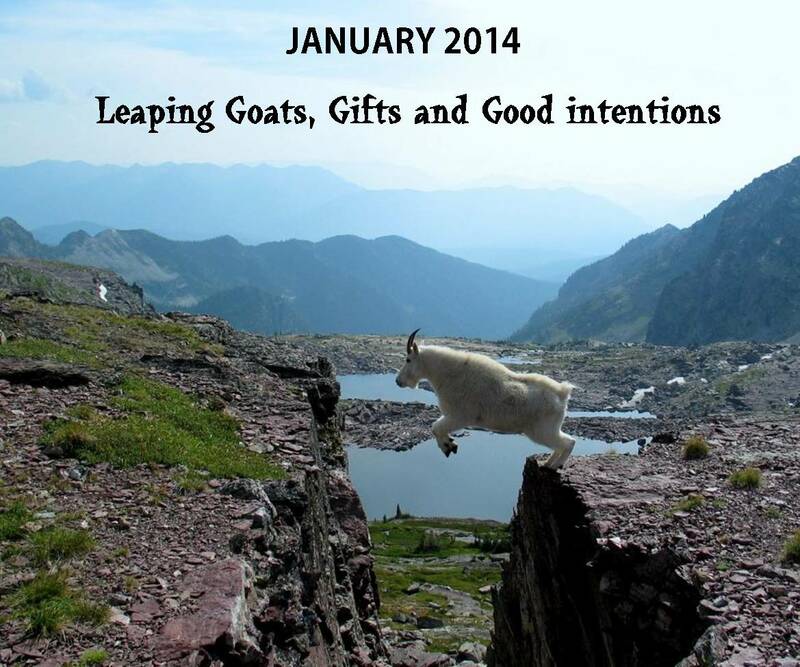 It’s intensified radically this new moon and sets the scene for 2014. Let’s try and understand it better, so we can work with it and harness its energy. Cardinal signs (Capricorn, Cancer, Libra and Aries) have a pioneering, brave, initiating, “take no prisoners” type energy and we have 8 (out of ten planets) in Cardinal signs this new Moon. If you have any of your personal planets in Cardinal signs, it will be especially powerful for you. The bunch of planets in Capricorn – (lets call them our little herd of mountain goats) – are standing by, beckoning us to journey with them up the mountain, utilising their resourceful guidance, disciplined, mature, tenacious energy to introduce order and structure into our lives and make solid plans. First of all though, we need to identify which mountain we want to set our sights on and start the clamber, one step at a time. Somewhere along the journey, the chances are we may have to take a calculated risk and leap across a crevasse to get to another place in our lives or our consciousness. And this is where the other planets involved in the Grand Cross come into play this year. 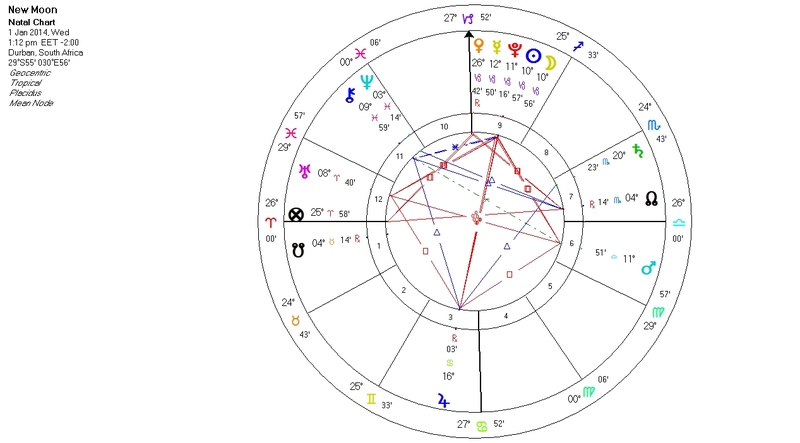 First let’s look at what a Grand Cross formation is – it basically occurs when 4 planets or groups of planets are in a square (or challenging) aspect to each other, normally depicted by red lines. The best way I can describe this energy is as a red box. Imagine yourself for a moment, inside this box, with no view out…. scurrying from corner to corner and back again, not able to see anything other than red. How does that make you feel… stuck, heavy, energised, tired, agitated, irritable, emotional, panicky, or maybe even a tad aggressive? Wanna get the hell outta there? That’s the energy of the Grand Cross. What to do? Walk slowly and gently towards the middle of the box, gathering your energy into a core centre line. Connect with the stillness of the present moment, in the centre of your heart, lift yourself up… and “transcend” out of the “chaos” – one Goat step at a time. From there, you become the observer, with a birds eye view of what’s going on, the patterns that are being triggered and whether action is required or not. Other than our little bunch of mountain goats, the other planetary gifts in our red box are Jupiter, Uranus and Mars, describing the landscape for the rest of the year. Jupiter in Cancer calls upon us to connect with what we’re feeling… in fact, without reacting, to let those feelings to grow, rather than push them away. To allow them to be present so as to assist us in expanding our consciousness in a nurturing way. Using our feelings as our compass, we’re then encouraged to journey a little deeper beneath the surface and unearth whatever has been stashed there, which is potentially the source of our greatest transformation. This is where Pluto comes in (which is positioned in the midst of all the mountain goats), encouraging us to investigate and question everything …our beliefs, the roles we play, whether we’re being honest with ourselves and others, where we break our promises, whether we’re living authentically and maturely or expecting someone else to take the lead in our lives. Mars in Libra invites us to discover whether our inner masculine or feminine is running the show and asks us to balance them by placing ourselves in the centre of our internal scale, thereby embracing the qualities of temperance, tolerance and balance. And lastly Uranus in Aries encourages us to be active revolutionary agents of change in our own lives and on the planet; to leap out of our comfort zones, speak our truth and to really be the change we want to see in the world. This really is a make or break year people, where we have the potential of raising our consciousness to another dimension… or not. It all depends on whether we’re prepared to commit ourselves to making deep inner change. If so, the forces are with us. If not, I’m afraid we’re going to feel more stuck in our little red boxes than ever before. Before or on Old Years Eve, do yourself a favour and quietly contemplate or journal the past year, sifting out the lessons and the awakenings. And then let go symbolically or ritually of whatever you don’t want to carry into 2014. Reflect on the changes you’d like to make in the New Year and what you’re prepared to commit to with your whole heart.